Post subject: Re: Why Not the Pearl? Look under "Places to Sail" topic. Search "CA -"
Exactly it, gino. The biggest difference between sailing then and sailing now is less access to the water. Unless you own waterfront or are a member of a club of some sort, count on more time being spent trying to get in and out. So, a boat like a Pearl that requires more setup time will not sell to day sailors in the US. The Getaway and the Wave may be resort boats but the Wave in particular has morphed into other uses (Rick White). The Getaway is a boat used by families who are part of the regular beach or lake crowd. If I were to take a guess, that is probably why there is a fleet of F18's in Redwood City. There is gated mast-up storage across the street from the boat ramp. They can leave a bunch of the rigging in place. Maybe I'm just full of it, but even looking back at my days of sailing 30-ish foot monohulls, there is a fair amount of setup and tear down time involved. I'd say that there is however a difference in that around here a wet suit is pretty much a must and as a result it is difficult to take out a friend or two for a casual day of sailing. Well that is idiotic. Basically, Hobie Cat is too afraid to affect the market and too afraid that the boat will flop to take a risk on a new boat. You know how we got the H14/16/18? Hobie Alter saw a gap in the market and took a risk on building something new, but he trusted that he had an active contingent of surfers that would be interested in buying an affordable beachcat. I contend that the Hobie Pearl would not "fracture" the H16 market, no way no how. If you're worried about the H18/20 fleets, you've already killed them, it's just a matter of time. There is a reason that there isn't a consensus on a new boat from the Hobie community. Half want a new H16, half want a new H18/20. There are two groups, devoted to their different classes of boat. The 16 sailors like the ease of entry and the simplicity of an "entry level" performance boat. The 18 & 20 sailors like the greater capacity, versatility and tunability of the larger and somewhat higher performance cats. But if the fear is truly that there will be a further dilution of the existing market, then bring back the 18. You're re-building an existing class rather than introducing a new one. Either option is likely to be an initially painful endeavor for Hobie Cat... a new boat would take years to develop an active racing community around a new model of boat, and before there's much of a racing community, it's going to be a tough boat to sell. At least in the meantime, the larger cats/Pearl make very good daysailors. But if it's well designed, modern and offers clear advantages over the existing boats, and in the same price range, it's going to generate a lot of interest. Not many are going to clamor to buy a "new" H18 with an antiquated design. Price is a problem. Pearl or H18, if the boat is $20k, it's not going to sell. Whatever the new option is, it needs to be close(ish) in price to the H16. Perhaps $12-16k range. I know that is easier said than done, but that's what NEEDS to happen, imo, for the boat to be successful. I have to agree with others that the primary inhibitors to growing interest in the target market are affordability, lack of exposure and accessibility. Let me further explain that I AM a part of the target market. I bought my H18 three years ago at 23. I came from powerboaters, rode on a H16 at a young age and was hooked. In the Western NY area on Lake Erie, there are old beachcats all along the waterfront, many seldom used, but there is still a pretty active fleet here as well. That exposure only helped grow my interest. I never considered rotomolded, because I didn't want a boat that I was going to quickly outgrow, or a boat that was limited in terms of performance, so my choices were H16 or H18. I went back and forth a lot, but settled on the 18. However, just out of college, I owe more in student loans than my parents' mortgage. I was never going to buy a new boat right off the bat at $10k+. I needed something AFFORDABLE. I bought a used H18 for a little over $1,000, and have enjoyed it like nothing else. I've poured about $6,000 into the boat (both upgrades and maintenance - EPO's, downhaul, wings, rigging, etc). I'm just now beginning to contemplate on whether I'd buy a brand new boat. I'd like to, but it won't be for some time. And it won't be a 16. I don't argue that they're a good boat, but from an 18, it seems like a step backwards. 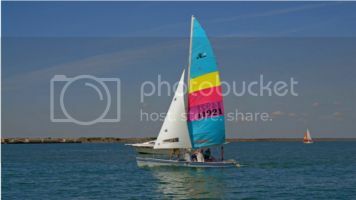 It suits a somewhat different style of sailing, and serves a different purpose in the market. Now, I also have a number of younger siblings that really enjoy sailing with me, but I don't think they'd get a boat of their own - YET (I'm working on it ). Their hesitation is definitely the time and effort it takes to setup and teardown, the cost of the boat & cost of maintenance. There isn't a whole lot of beach left where you can just leave it mast up, so trailering and access to the water have become critical sticking points. Ultimately, I think the H18 & 20 left a void in the lineup that no other boats currently fill (hence why it keeps coming up), and that is the direction that Hobie needs to go with a new entry, but without proper pricing & marketing, it's not going to gain traction. If they can improve trailering and setup in the process without compromising performance, go for it, but if the price is too high the rest won't matter.